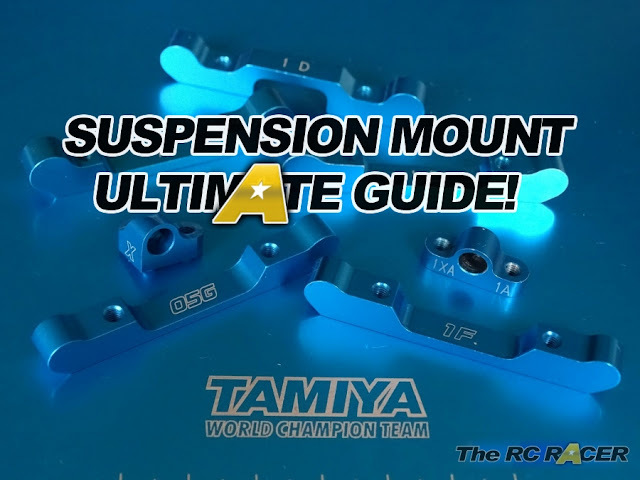 With the Shizuoka model show approaching fast there are a few interesting new Tamiya's listed on the release list. The most mysterious one on the list is the tentatively named 'Beginners RC Car'. 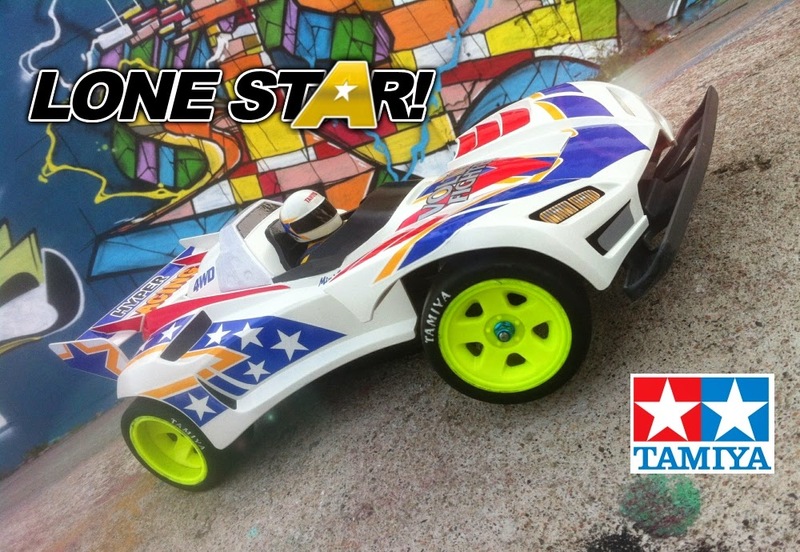 However this is not Tamiya's first foray into creating a beginners RC car. 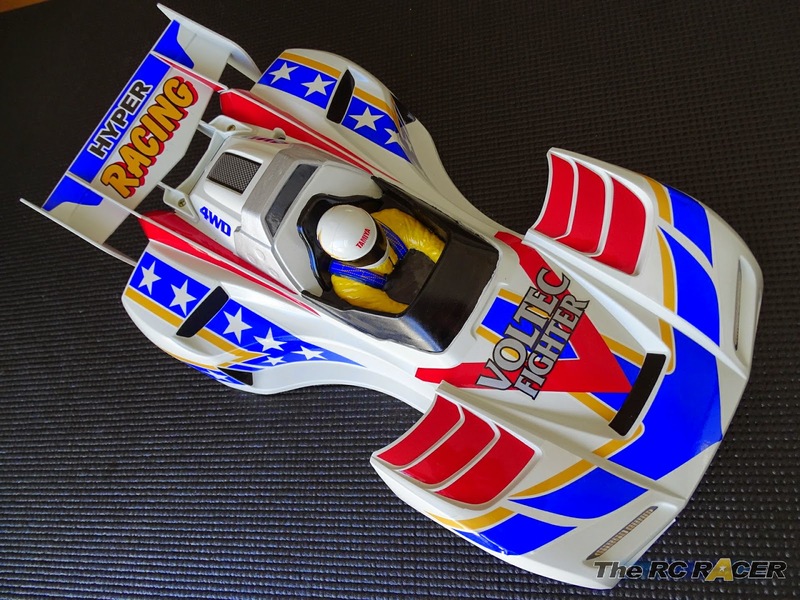 The RC Boys series was released in 1997 with the Voltec Fighter and soon it was followed in 1998 with the Wild Ceptor and Thunder Blitz. 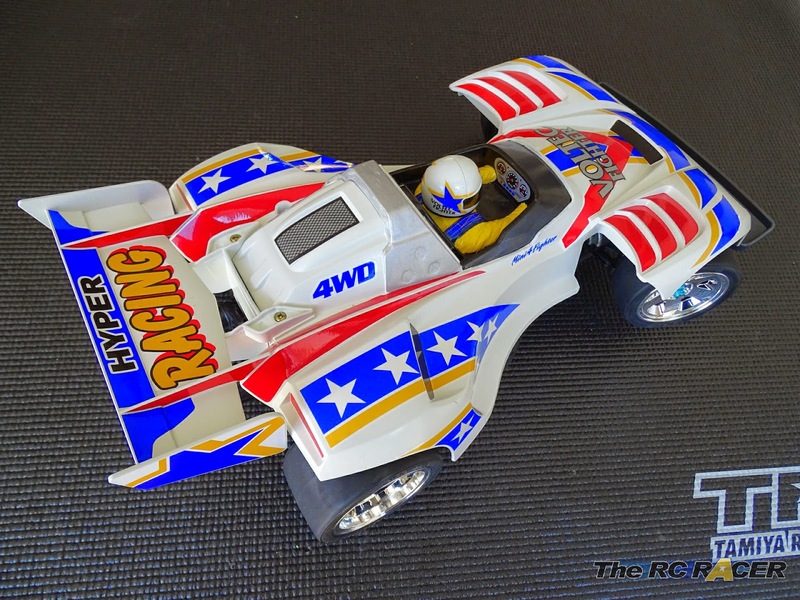 The focus of these cars was to act as a bridge between the Mini4WD cars and Tamiya's RC model range. The cars never really took off and some people absolutely loathe them, but I have always been a fan so let's take a closer look. When you open the box you instantly notice that the wheels and tyres are already mounted, the chrome glistens in the rare Manchester sun. 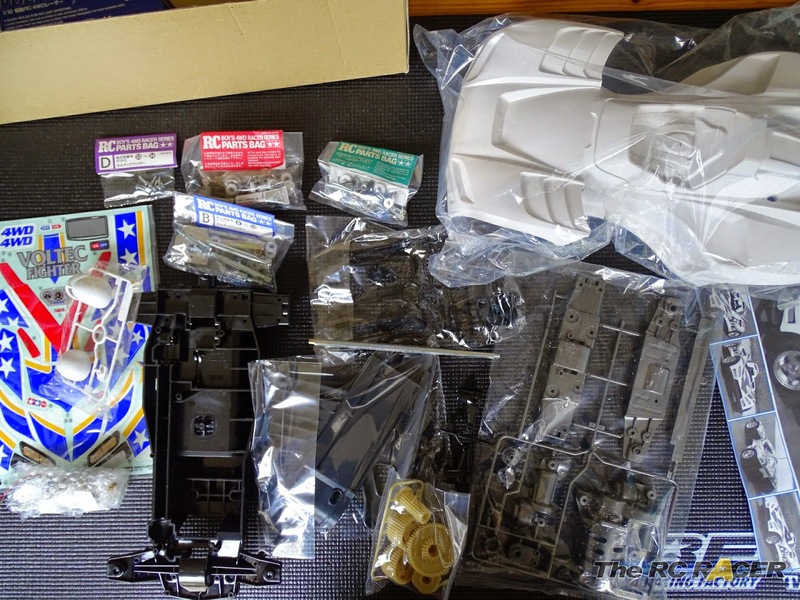 As this is a beginners kit there is not a lot of parts involved to construct the chassis, so let's start the build. I want to make this a very special version of the car so I am going to use all of the hop-ups available to ensure it's able to reach its maximum potential. Bearings are first on the list as the car comes with bushings. 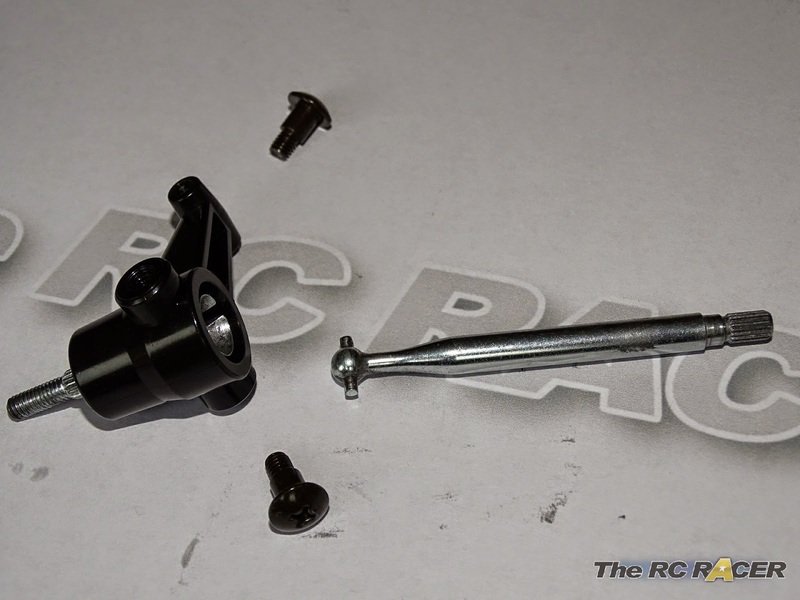 I contacted Colin at www.RCbearings.co.uk and ordered the following for the build. The chassis, it's heavy but strong and yes the upper arms are rigid! 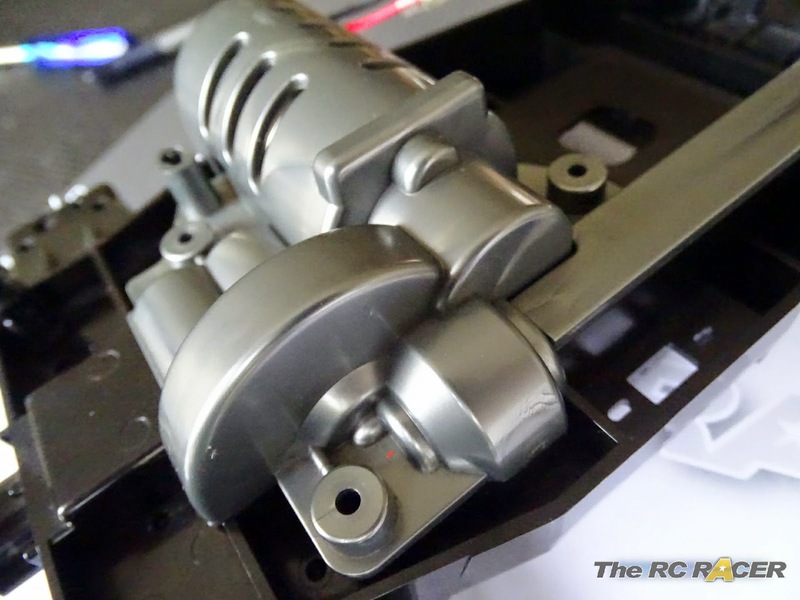 A close look at the chassis soon reveals one of the reasons why this car has so few parts. The upper arms are moulded onto the sturdy bathtub frame. 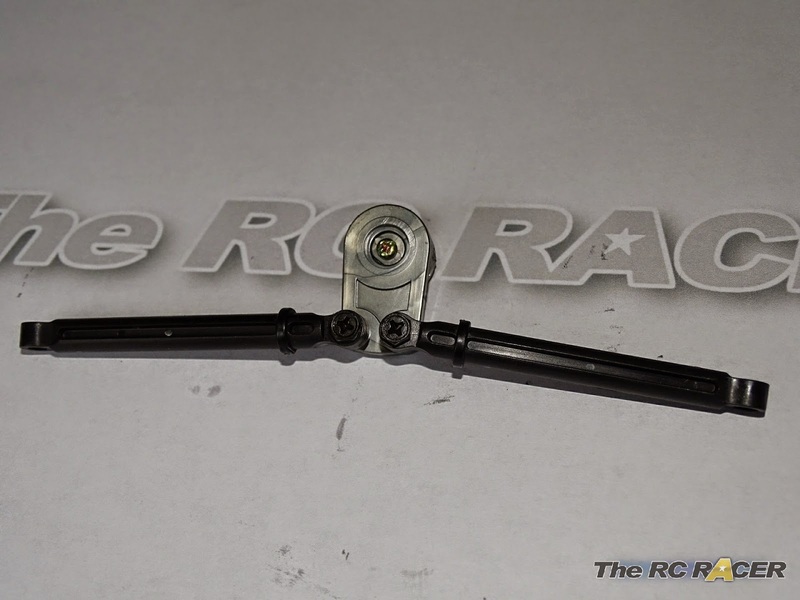 This eliminates the need for upper arms and just incurs the small cost of no sprung suspension for the car.. Natch! The first step is to fix the rear body posts to the chassis. 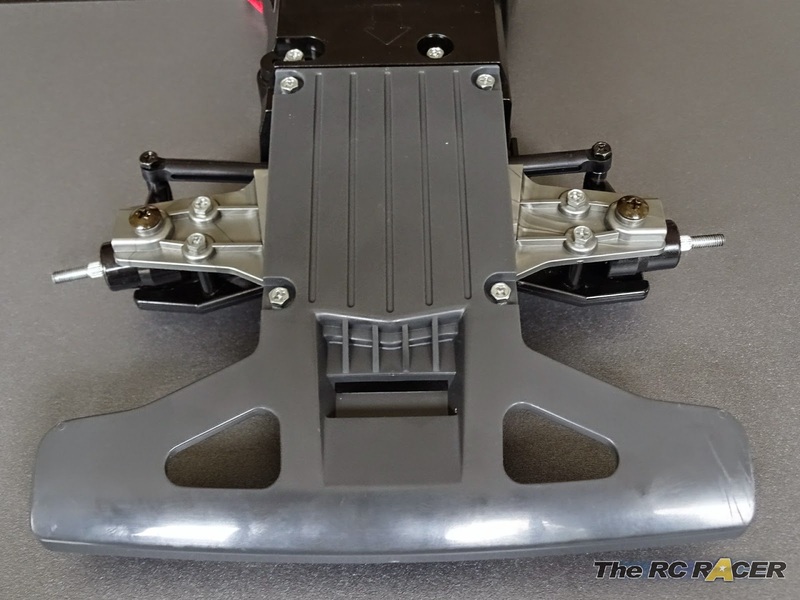 As you can see they are not what you would expect on a regular RC car, that is because the body attachment is another unique feature of the car that you will see later in the build. 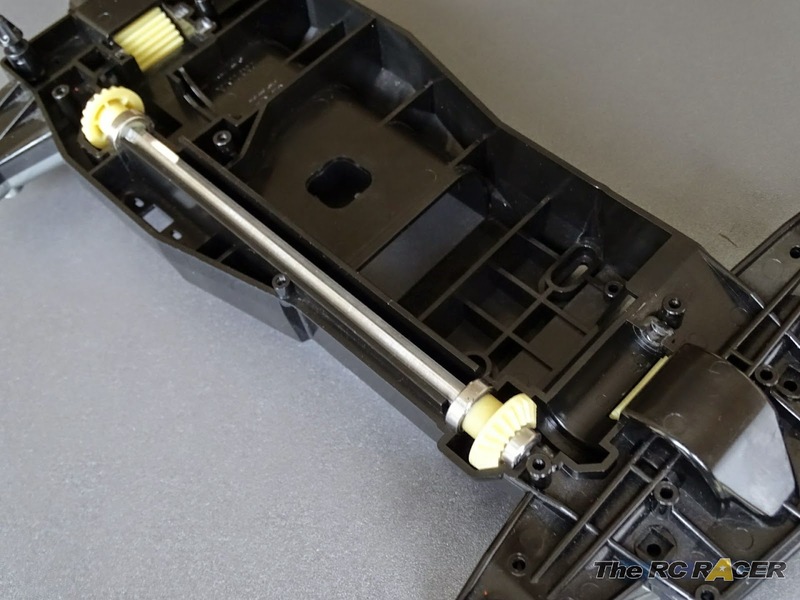 Only 5 minutes into the build and the quirkiness of the chassis and the body mounts are already defining this kit, so let's make it a hat-trick and look at the screws included in the kit. 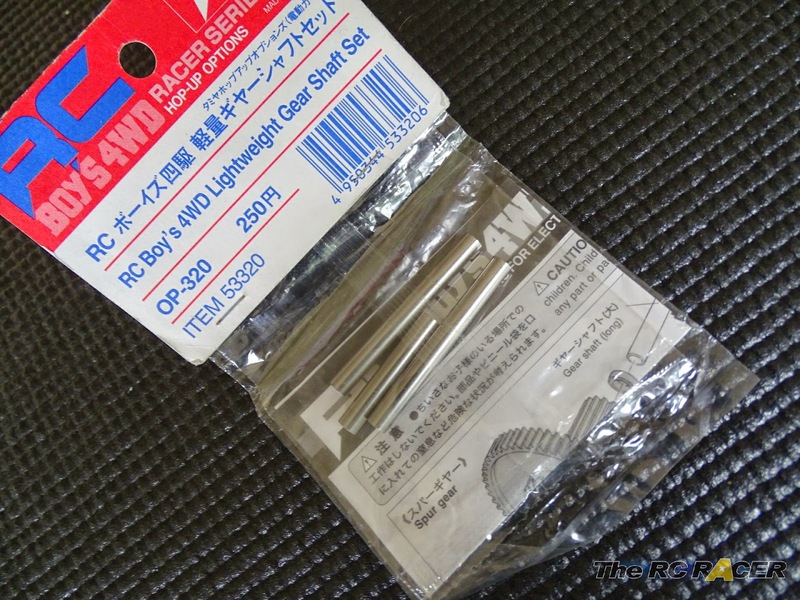 Yep they are bolt headed screws so the beginner can just use the classic Tamiya Wrench included to build the car. 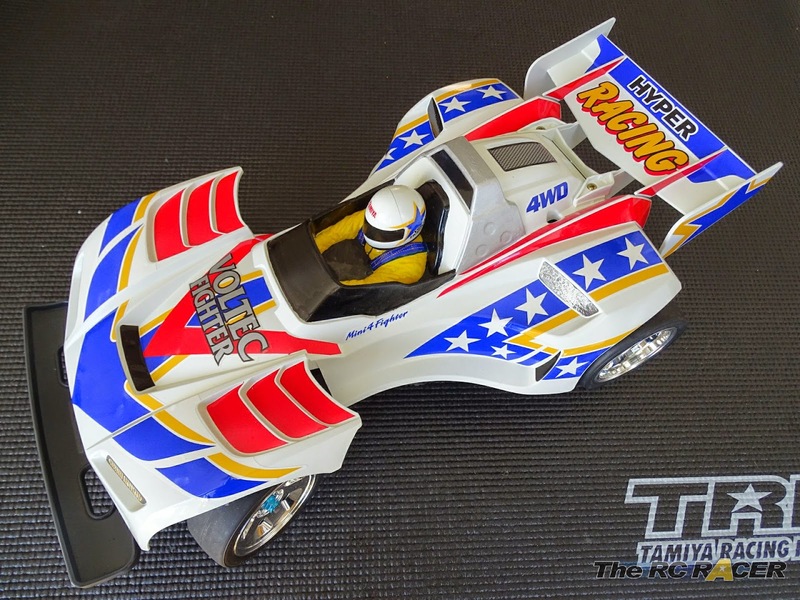 That's the sort of thought that gives Tamiya their uniqueness in the RC market. Things are a bit more conventional as we move onto the differentials. 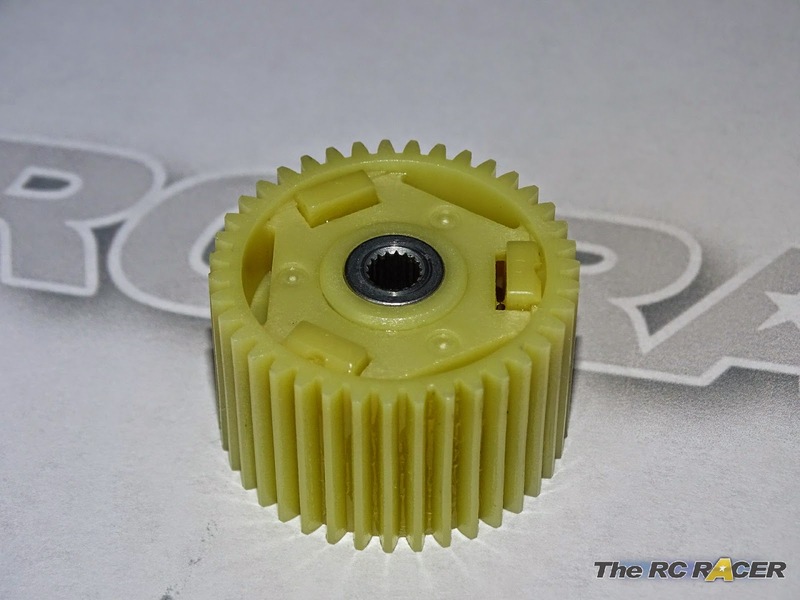 Classic Tamiya bevel gear differentials with a clip together case. 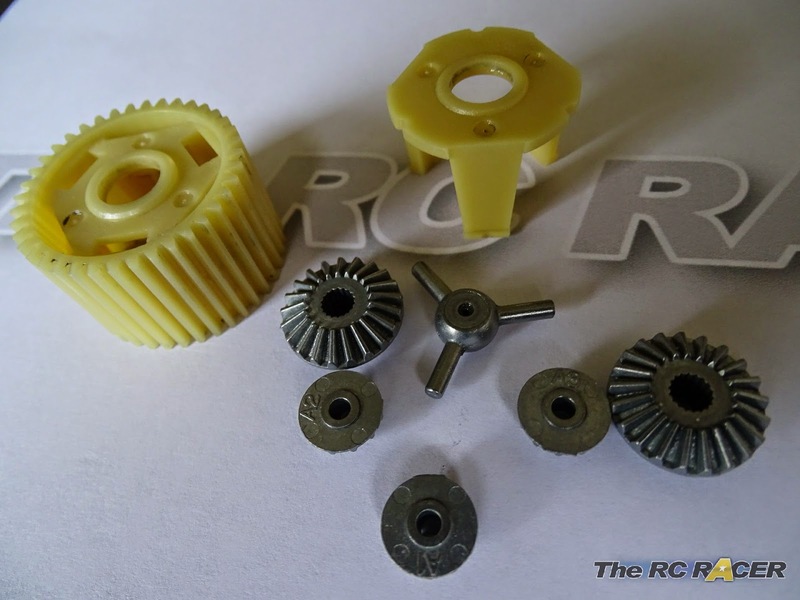 As you can see they are the classic spider gear design that have been used in many Tamiya kits. The main difference is that the diff case clips together. I made the rear diff up and just added some AW Grease to make it a little sticky. 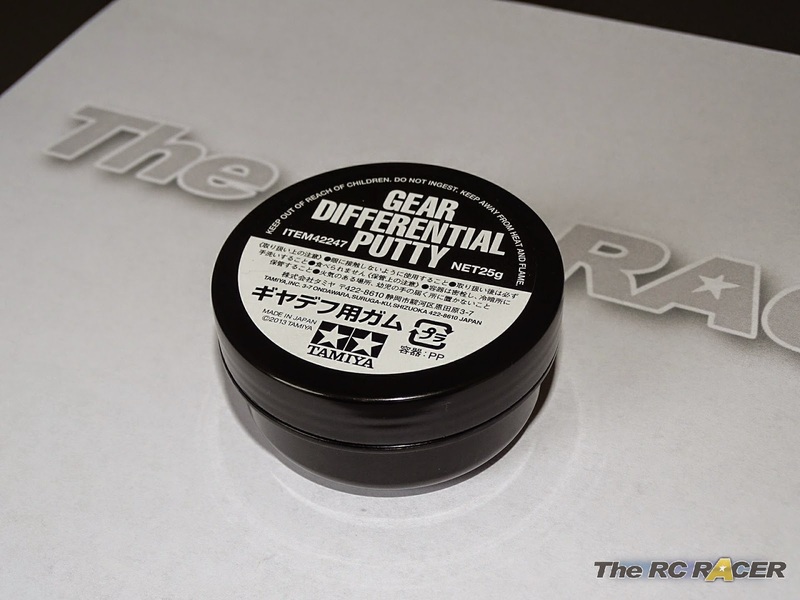 Tamiya 42247 Gear Diff putty is great for open diffs very little chance of it leaking out. For the front diff I wanted to make it much stiffer so I added some Tamiya Gear Differential putty. 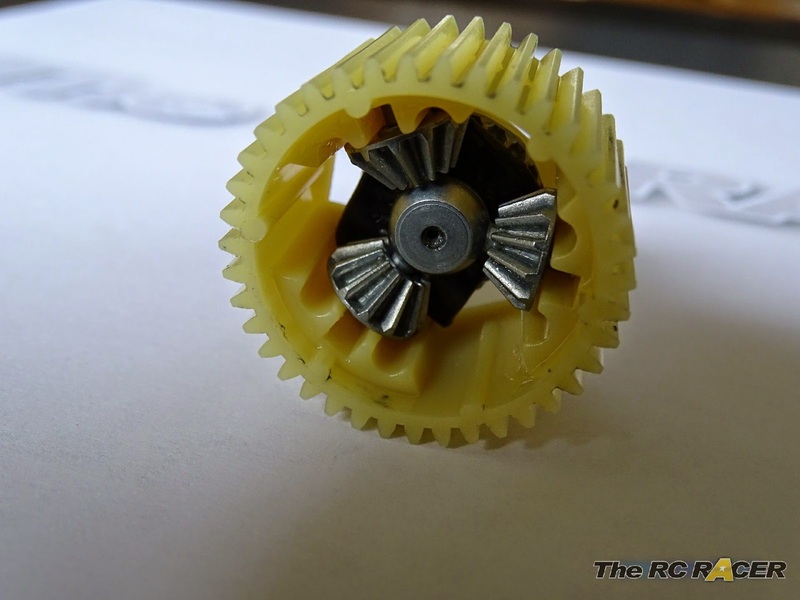 As you can see I added a small amount of putty on the main bevel gear that captures the spider gears. This will give me a stiff diff but not a spool effect. 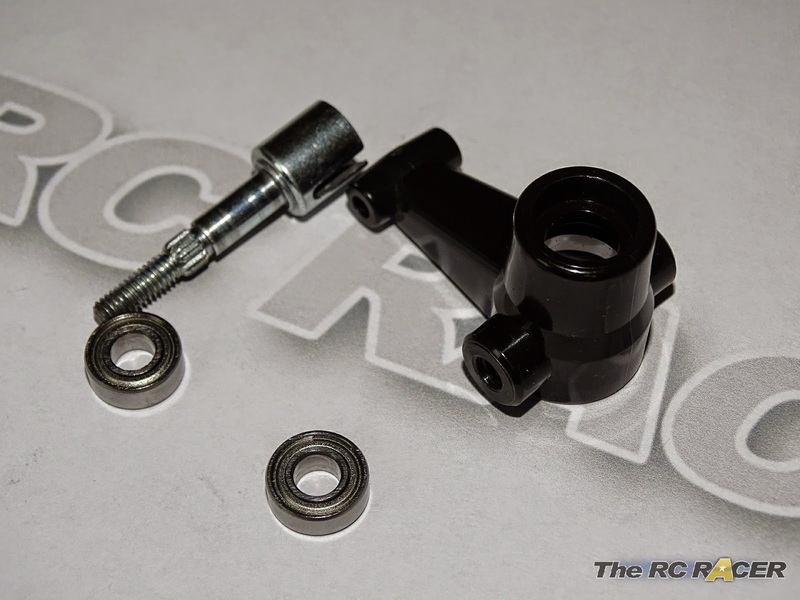 Bearings are essential to get the best from any RC kit. Time to fit the putty filled differential into the chassis. I fitted the 1150 bearings either side. You need to then attach the lower arms strut across the upper chassis arms and fit 6 screws to hold it together firmly. There is very little power loss on that differential to the wheels! Here you can see the rear drive shafts. They are solid steel as as there is no suspension they are also the wheel axles. So one benefit is that these are like universal drive shafts...albeit at the rear, not the most important place on a car. Time to just slot in the rear diff and drive shafts into the chassis and use 8 screws to fit the lower chassis strut. The car comes with a heavy steel propeller shaft, I substituted it for the alloy Hop-up. 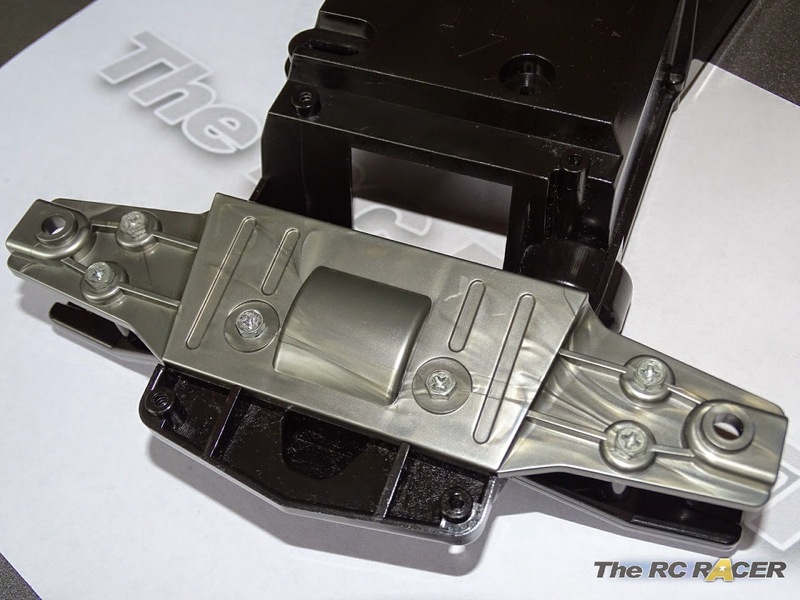 This saves nearly 30g of weight and it also reduces the rotating mass to allow the car to accelerate a little quicker. The whole propeller shaft is then assembled. The prop is mounted on some 1510 bearings, these ensure that the car's drive-train is smooth and very strong. There are two 1150 bearings at each end to ensure the shaft stays aligned. As expected the shaft just falls into place. 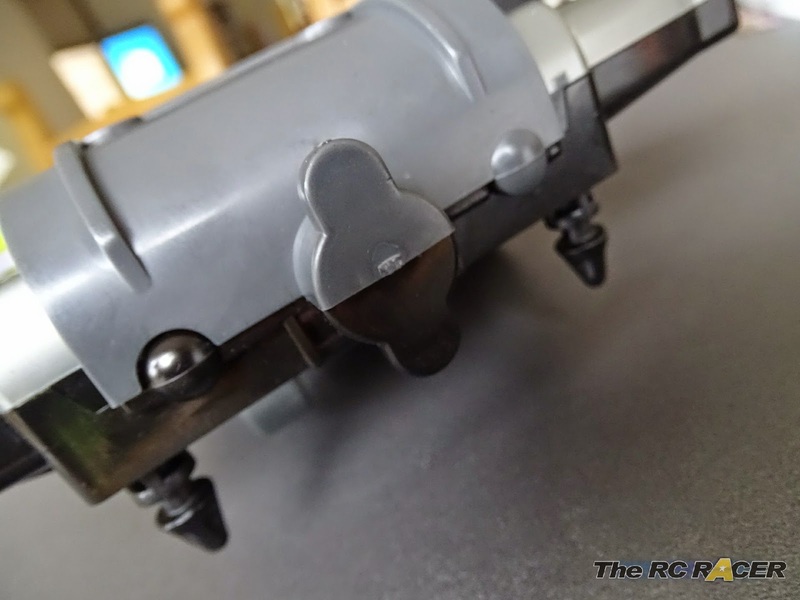 There is a prop protector made out of the silver plastic that attaches to the chassis and ensures that inquisitive fingers will not get nipped by the shaft when it spins. 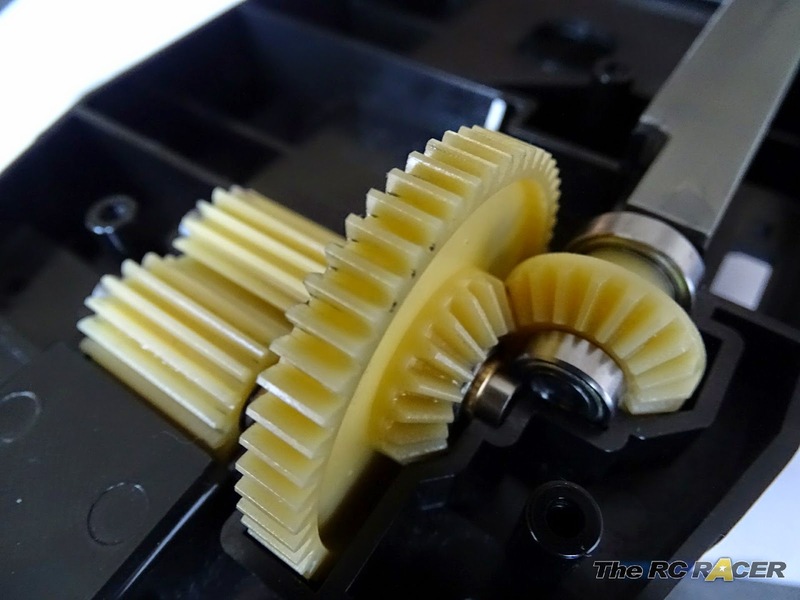 Tamiya 53320 lightweight gears reduce weight in the car. The front counter gear is next and as we are building the internal gearbox it is time to open the next hop-up bag. 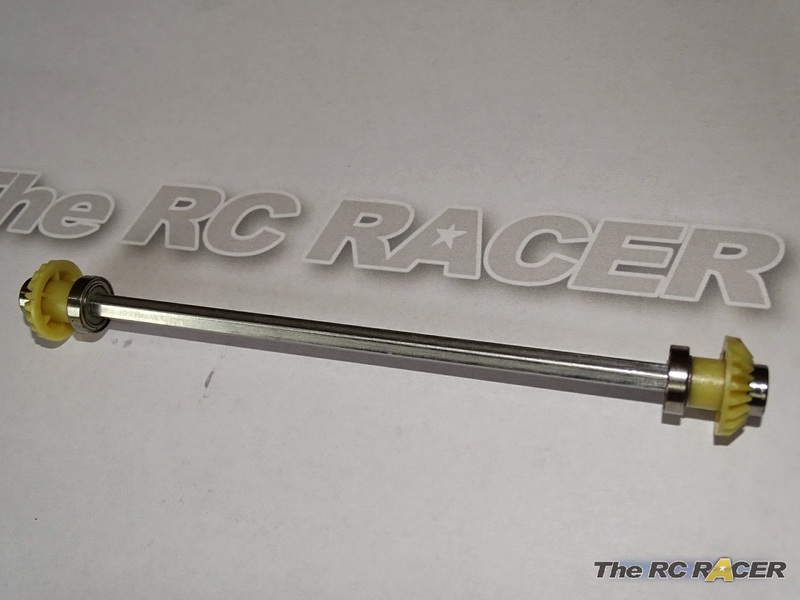 The lightweight gear shaft set reduces the overall weight of the car by 24g so it's worth it for that reason alone, again it will have less spinning mass as well. 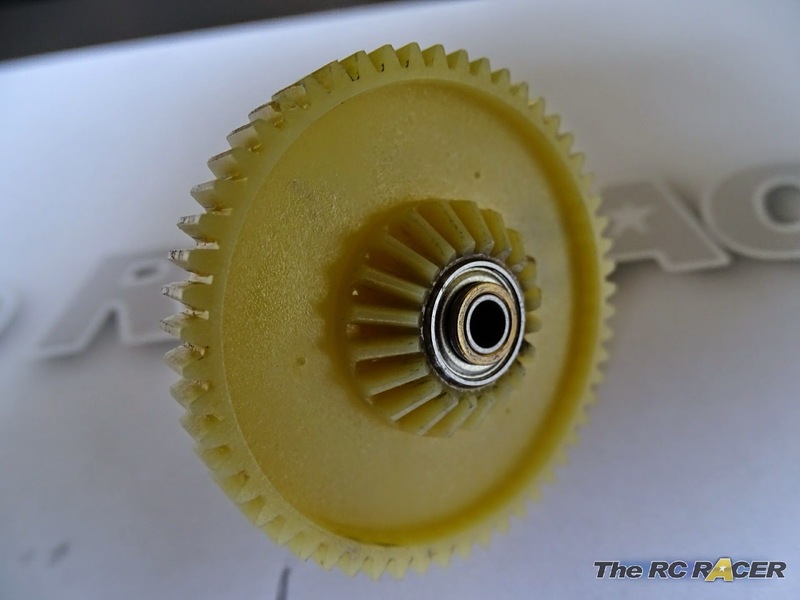 The Counter gear uses 1150 and 850 bearings to spin on the 5x45mm shaft. 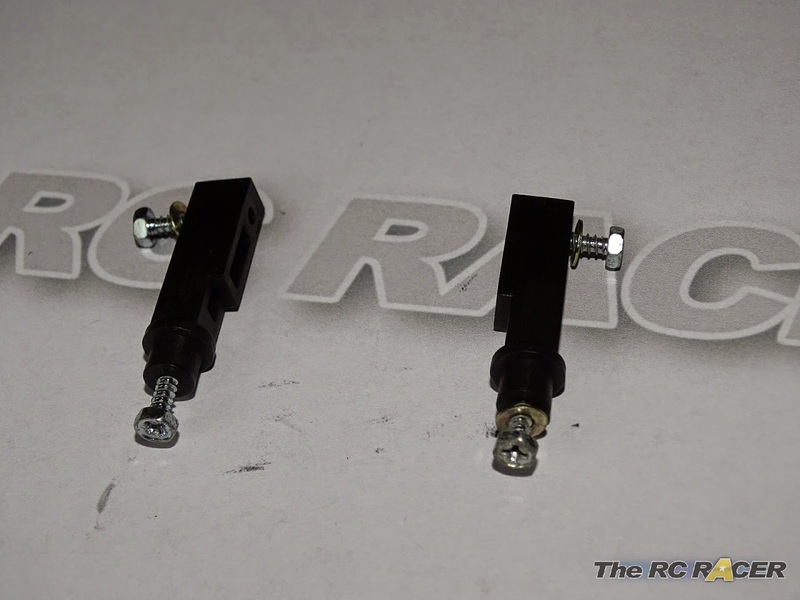 There are some small 1mm spacers that reduce backlash as well. I like the silver and black colours, makes the car look even more different! The counter gear is then held in place with the upper gearbox cover. The Voltec Fighter has a 56t spur gear. This again is mounted on a 5x45mm shaft with bearings to allow it to spin freely. The idle gear fits in next, this has the smaller 5x30mm shaft and relies on 850 bearings to ensure that it spins freely. The 380 motor included is fine for beginners and will give great battery life. 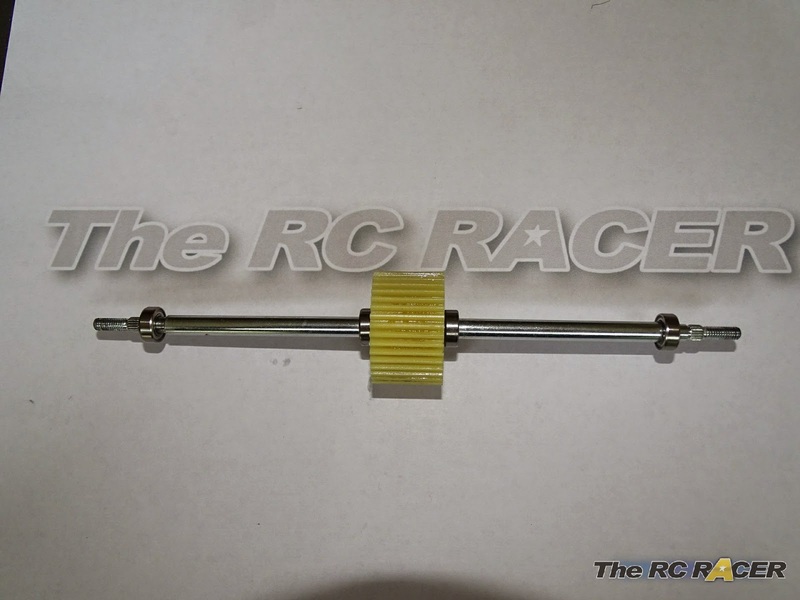 The RC boys cars come with a 380 motor with a 9t pinion. TIP - The Internal ratio of the cars is 2.437. This is because it has a 39t diffs and a 16t spur pulley. 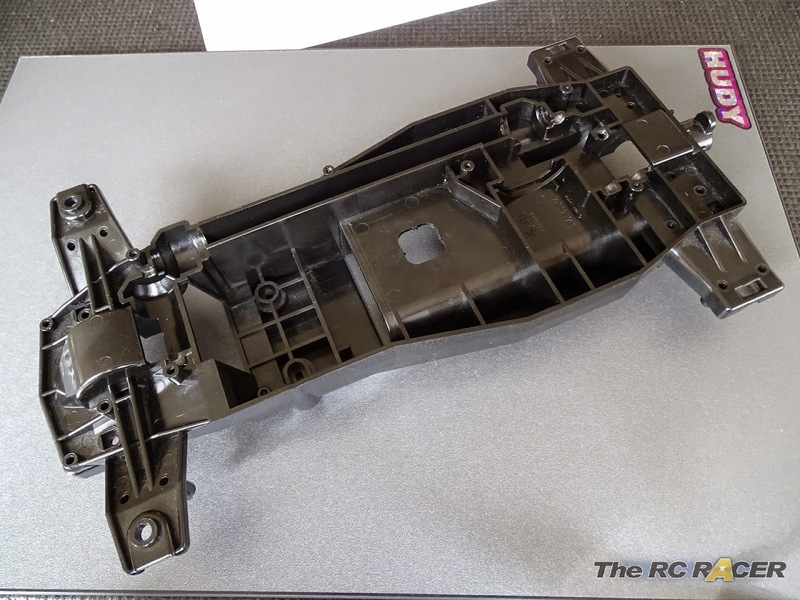 This is the same as the TA01/02 etc cars and you can fit their spur gears into this chassis if you want to do some more excessive mods (Maybe I will do it in the future). This gives the car a FDR of 15.16. This is going to make it quite slow but it is for beginners. 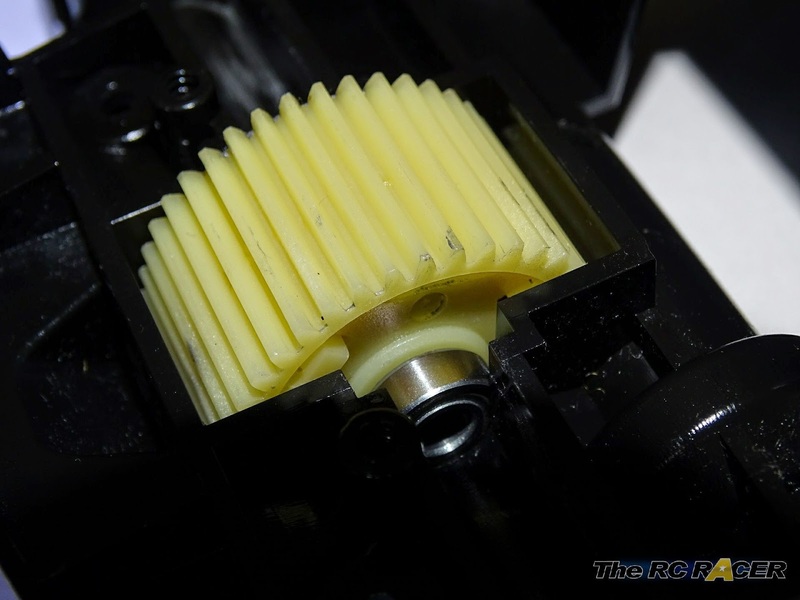 You will need to do some quite serious modifications to the motor mount to fit other pinions. 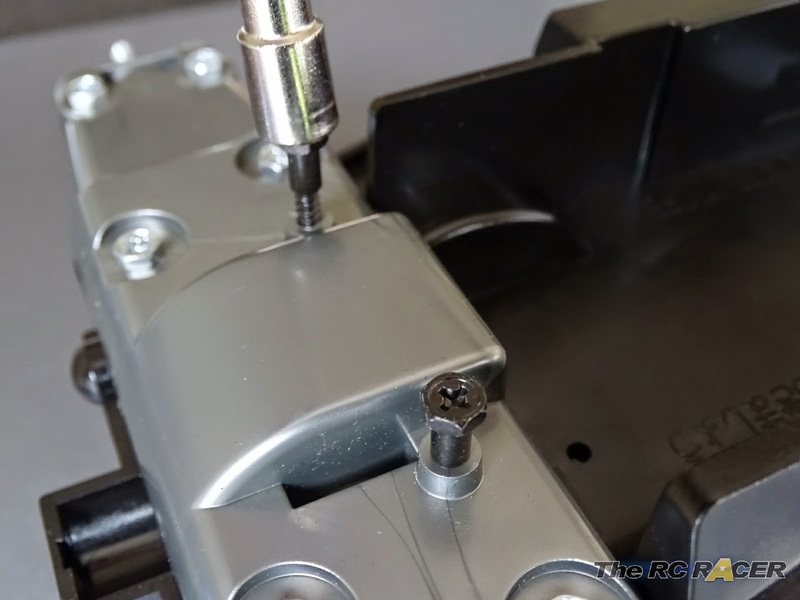 You will need to file out the top screw hole and also cut out the larger internal hole to be able to move a brushed 380 motor. 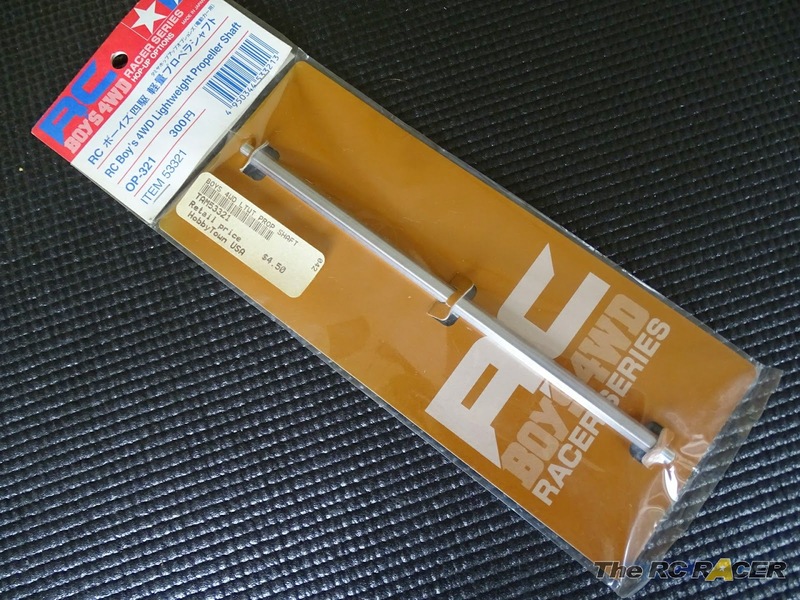 Luckily I had the Tamiya 53314 hop up 540 motor plate. 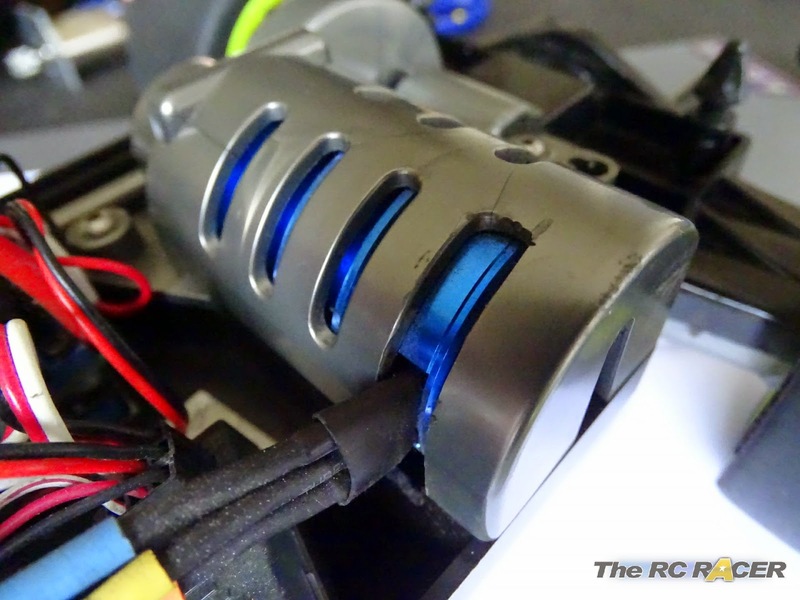 This allows me to fit a 540 motor that will give you a lot more power and speed. 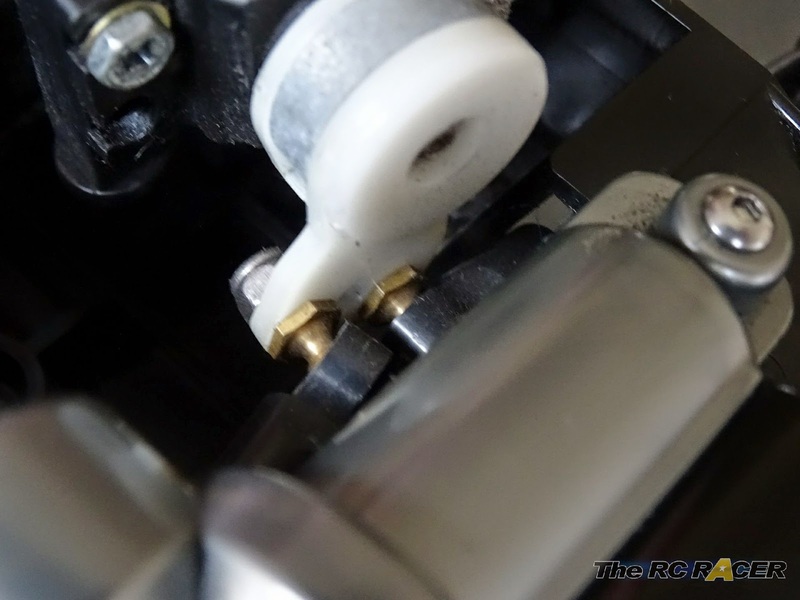 The motor plate is still not adjustable (For the reasons listed above) but it does come with a 13t pinion giving you a lower FDR of 10.49 and more speed. Everything is held down in place with the intricate motor cover. Once you fit the motor the upper motor cover holds everything in place. 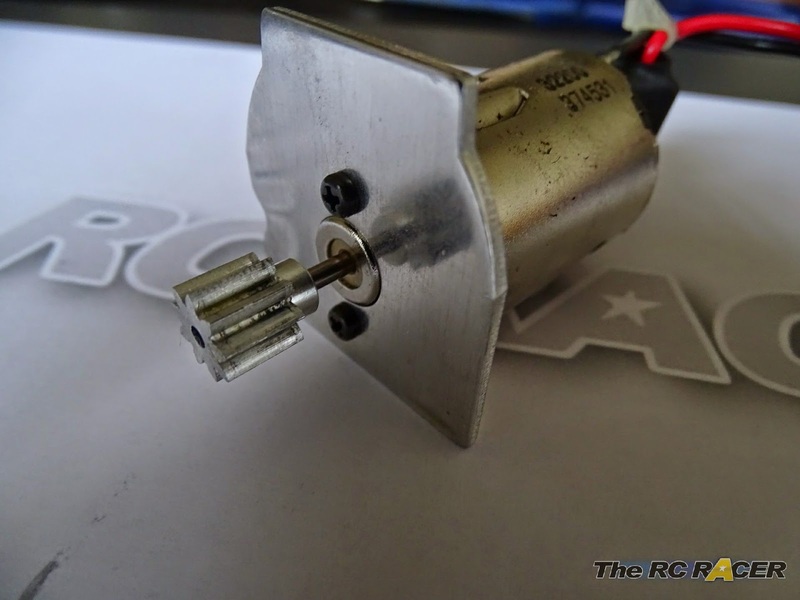 This is fine, but if you want to mod the motor movement with a 540 you will need to cut out some of the plastic to allow the motor to move. A small cut allow me to easily connect the motor wires. I fitted a basic 13t EZrun system into the car and just cut one of the ventilation holes a little larger to allow the motor wires to come out. 1150 bearings are fitted to make the wheels spin as easily as possible. 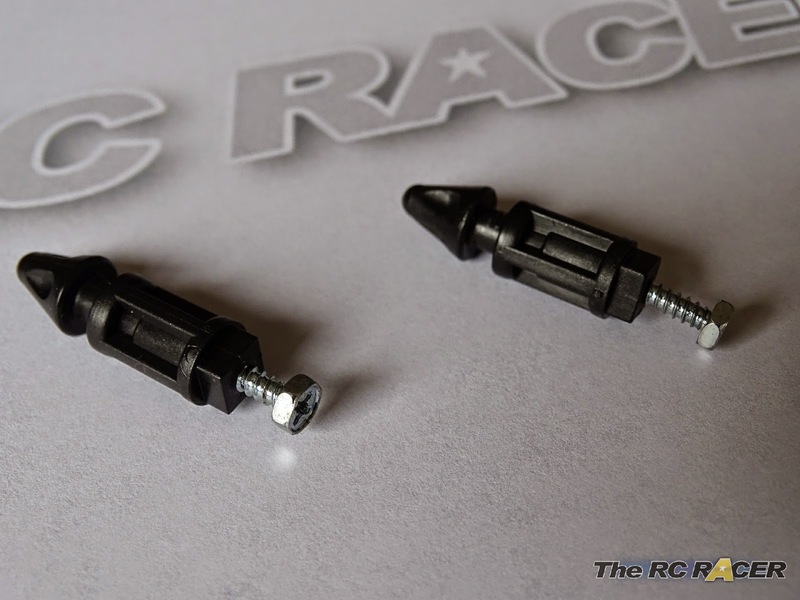 The front uprights will look very similar to the TL01 ones but they are slightly different. These drive shafts are heavy duty! The thick steel drive shafts are fitted into the diff and mounted into the wheel axles. 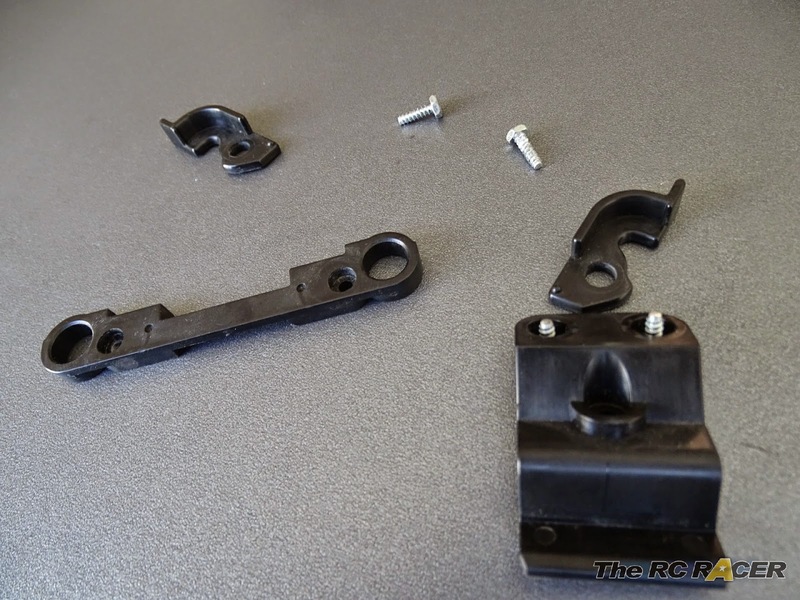 The two step screws hold the upright on the upper and lower arms and the whole assembly is smooth and free. The servo mounts are a little longer than a standard car. Not much here other than fitting the servo onto the really high servo posts. 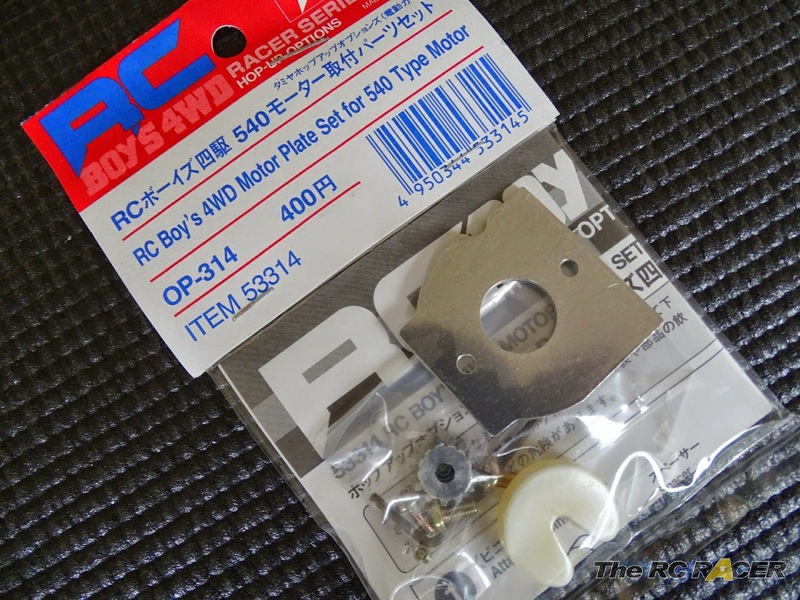 The servo saver is a standard Tamiya design. Tip - I put a tiny drop of superglue on the internal ring to make it stiffer than normal, but if it takes a large hit it will still work as the tiny spot of glue will break away. 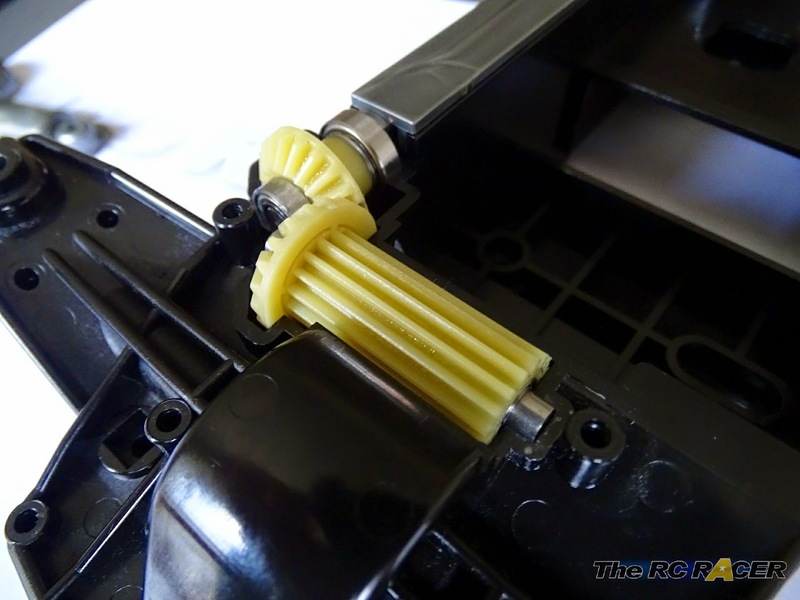 You then add step screws on the lower part of the servo saver and attach the fixed plastic arms. 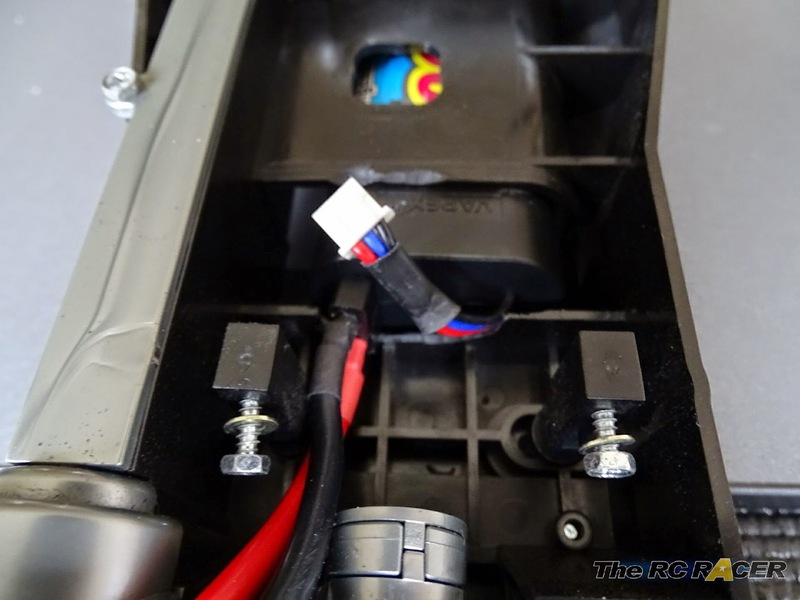 As you can see even a rounded lipo will not easily fit into the car. This is because they are a little longer than std Nimh packs. 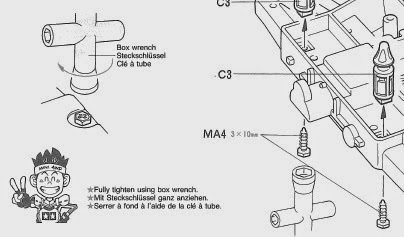 So you will need to cut away the following parts. 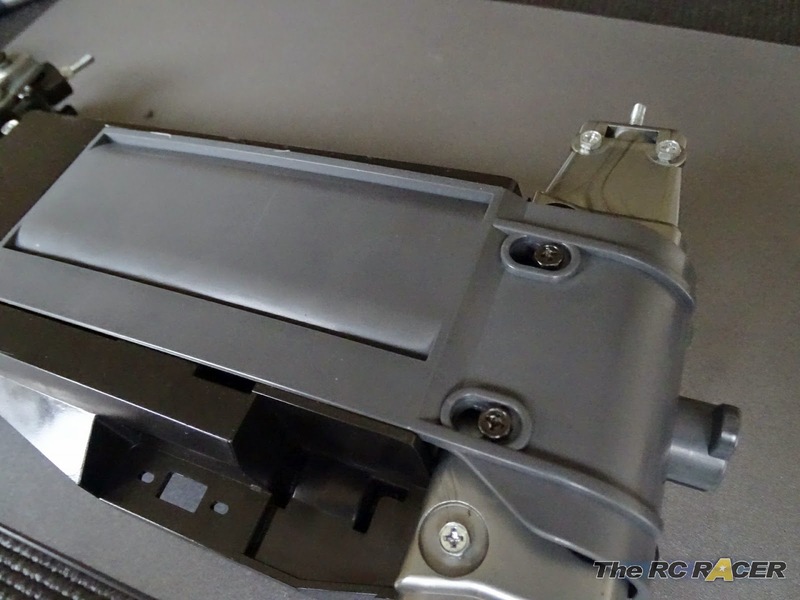 With this cut out you can move the battery around more easily, however you will not be able to get the wires to fit easily so you will have to cut the following parts away as well. Excuse the cutting. You have to do this at this stage otherwise you will need to remove all of the electrics, so check you battery fits. The best rounded lipos would be the ones with 4mm sockets as they would not have all of these wires. As you can now see it all fits and we can now fir the electrics and get on with the build. MOD- I replaced the servo saver with a High-Torque servo saver and added 5mm ball connectors. I really should have used blue parts to make it look more bling. 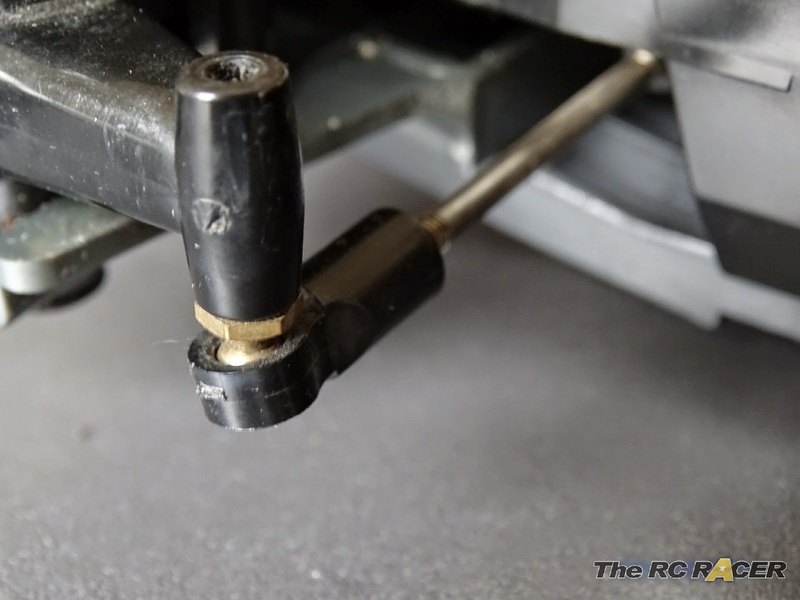 You then need to make two turnbuckles, and you will have a car with adjustable front Toe-in and Toe out. The bumper is very large and also pretty high on the final car. It weighs in at a massive 120g but it does incorporate a hole that the front of the shell will mount into. 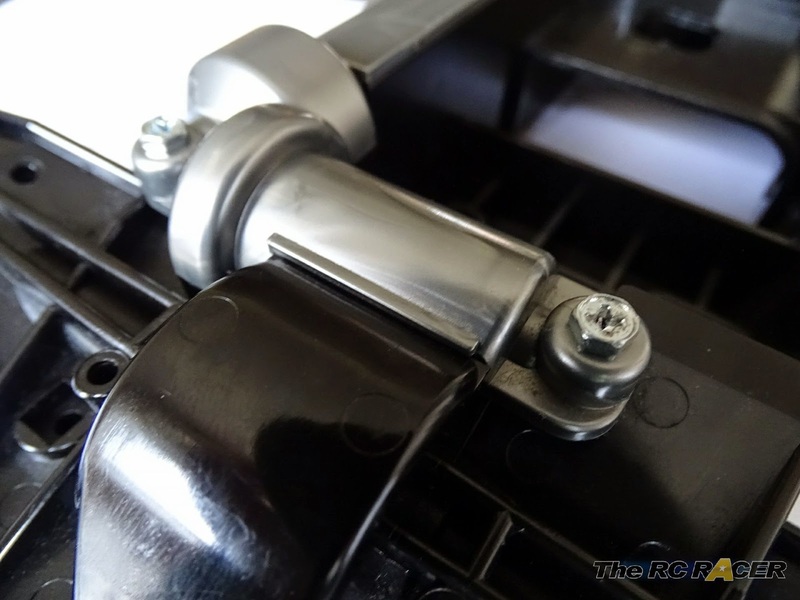 3x14mm step screws are part of the battery cover system. 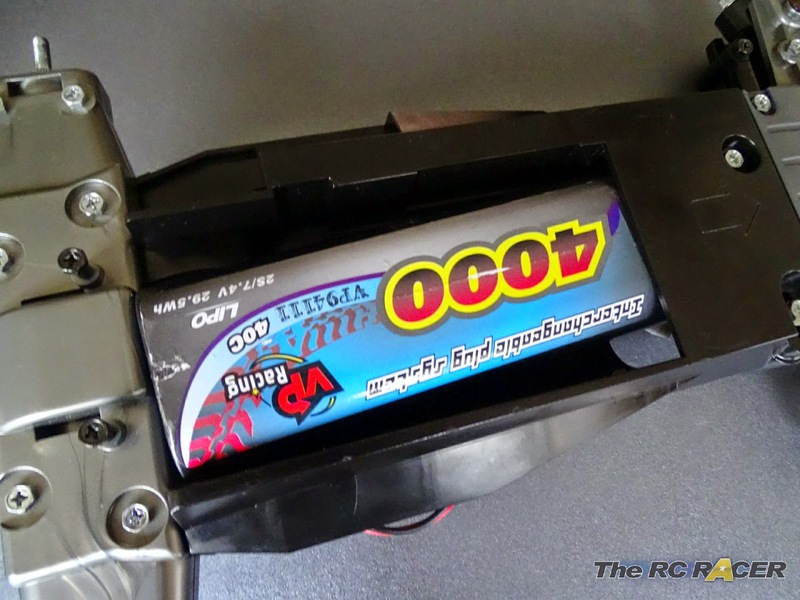 The way in which the battery tray is fitted is unique to RC cars although it will be familiar to anyone that has owned a Mini 4WD. 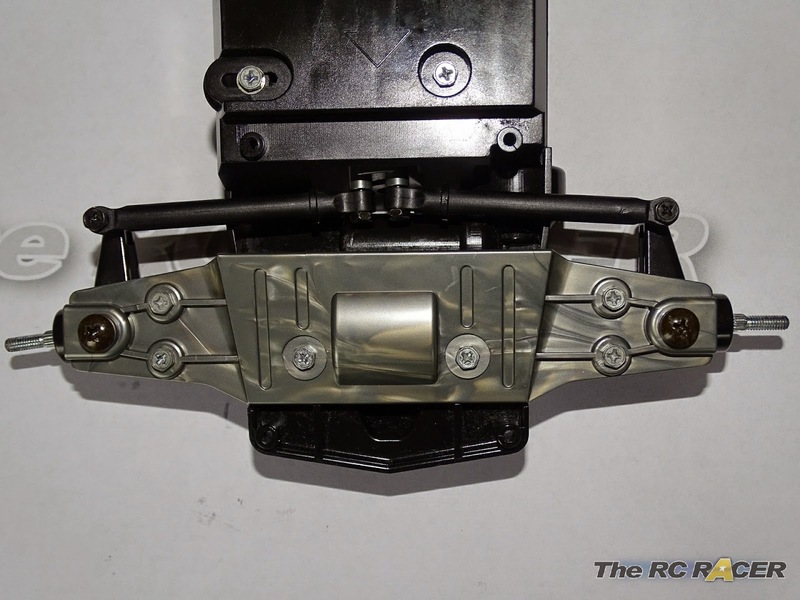 You need to attach some step screws to the rear lower chassis arms. Now you slide the battery cover on to the car using the step screws to align it. What is this tail hanging out of the end? This does not hold the battery on securely though, as you can see there is a strange appendage at the rear of the chassis. Twist it and you will have two rear exhausts that hold on the battery tray. You just need to add the C1 part to the rear and twist it around to ensure the battery tray is locked down. It also looks like two exhausts. With everything installed including the battery you can then check the Esc and steering are all set up to be running correctly. The kit comes with steel 12m wheel hexs. 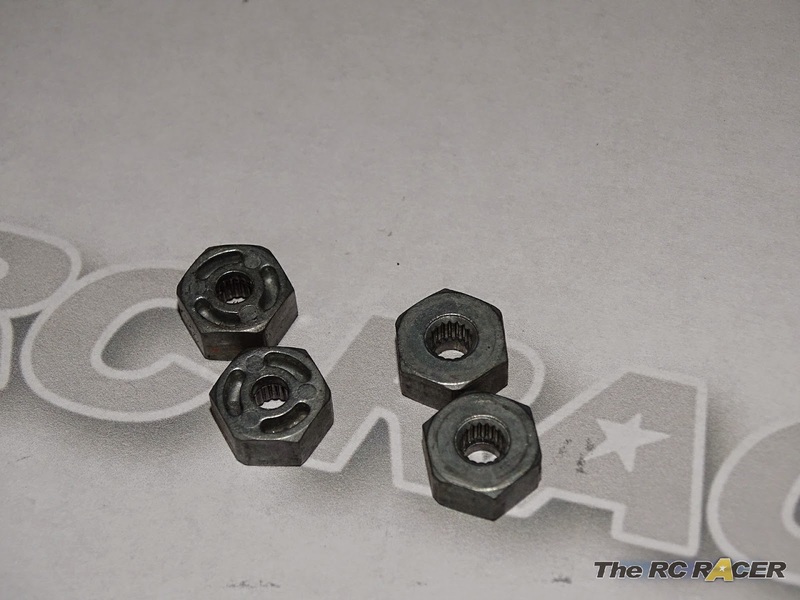 These are not located via a pin like most hex's instead they have grooves that allow them to slide onto the driveshafts/axles. This is fine for the power that it will take but you must be careful to not over-tighten the wheel nuts as they could push the wheel hex's against the arms and create binding. Once you have tightened the nuts spin the wheel and check the diff action works as you expect etc. 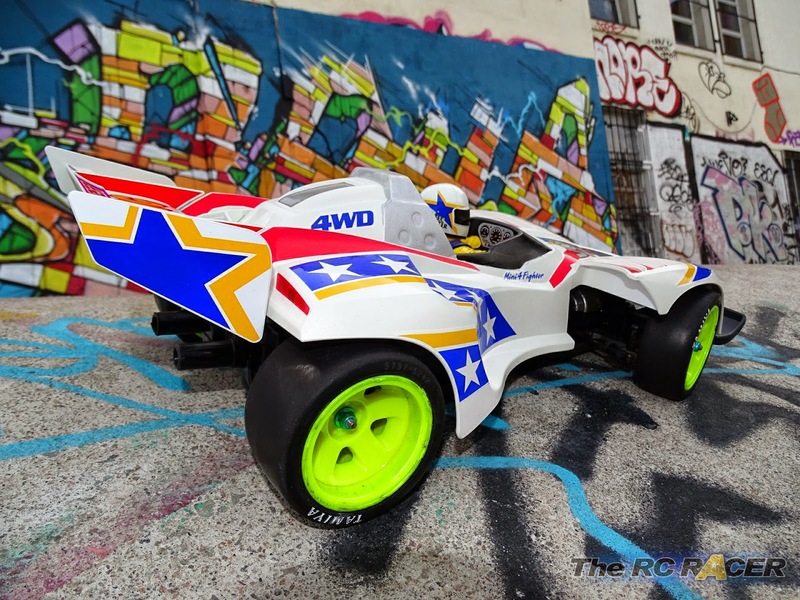 The shell is made from hard ABS and the styling is akin to the Mini 4WD cars. These can divide opinion but I personally love the way that they look. The chassis is very easy to make but the shell can take a fair amount of time if you want to ensure it looks good. There are a lot of pre-cut decals that you need to apply. 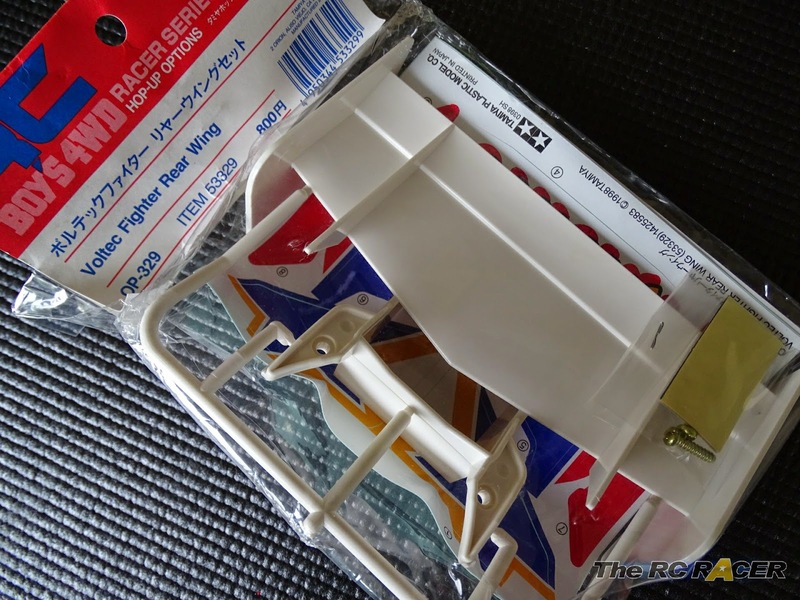 I added the Tamiya 53329 Voltec Fighter Rear wing. Now there is no way that this does anything to the car other than weigh it down even more. However it adds to the look of the car and I wanted my Voltec fighter to really look the part. Evel Knievel would have been proud! The final result looks fantastic! It definitely turns heads when people see it. So the final part of this quirky cult classic and as you would expect by now it has a novel way of attaching the body. The front of the body has a hook that fits into the front bumper, and the rear has two small arms that grab the plastic poles that we installed at the very start of the build. 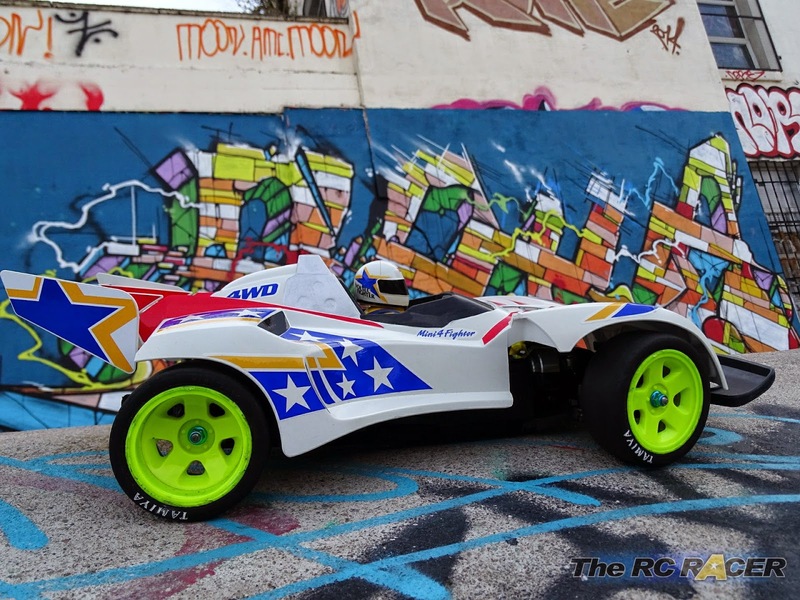 There really is nothing available that looks like the RC boys cars. Looks more like a rocket than a car! This gives the car a lardy weight of 1770g even with some of the lightweight hop-ups. Needless to say removing the rear wing and drilling a few holes in the chassis can loose you 150-200g quite easily. Here is a video of me racing the chassis with the Thunder Blitz bodyshell on it against a few TT01's a few years ago. I changed the wheels to some foam wheels as that is what we used, fitting TC wheels and tyres does lower the car to around 5mm so it actually helps it get around the track. The car was a little slippy but I loved every minute of driving it and I managed to keep up and actually beat the TT01's at the time. Here is a video of the build car just driving around the local car-park before the rain sets in. As you can see the car is fine on a flat smooth surface, the large rubber tyres can slide around a little but this adds to the fun of driving the Voltec fighter. 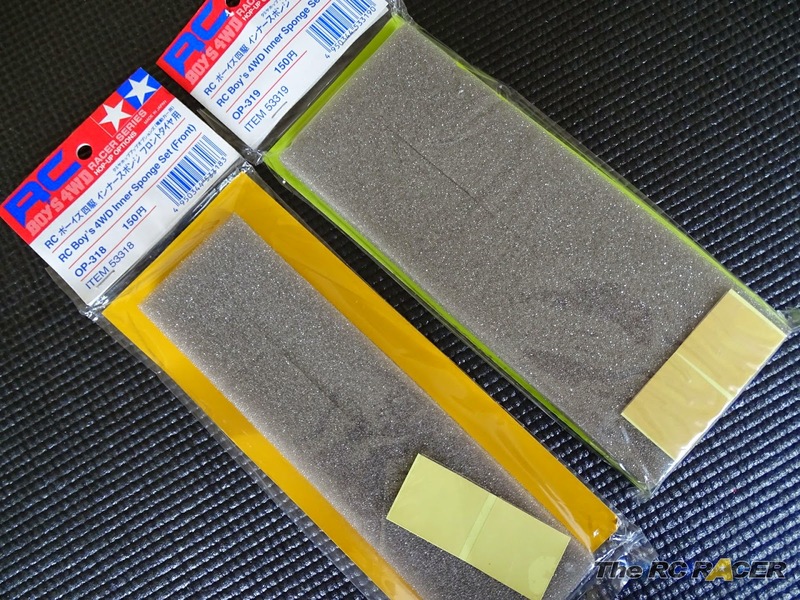 With a car with no suspension the only movement you will get is in the tyres, you can change the rate in which they compress by fitting the inner sponge set's for the tyres. 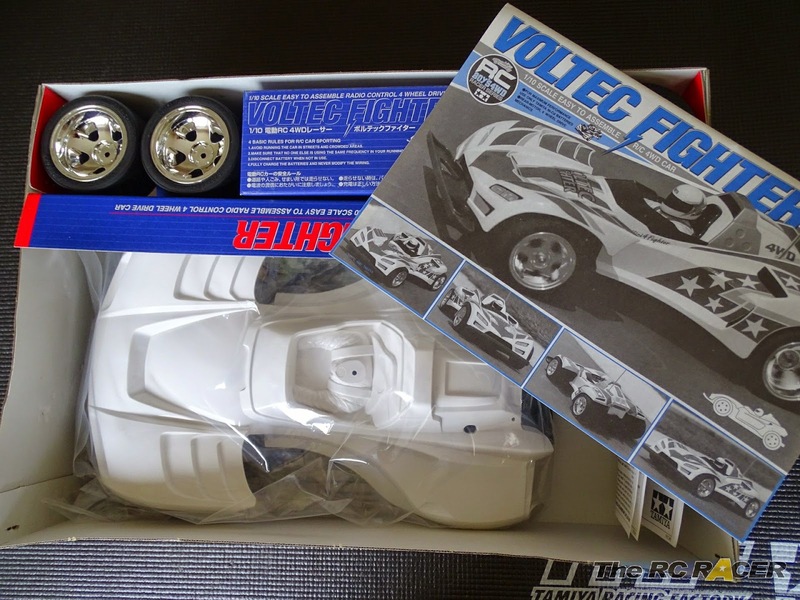 Needless to say that doesn't massively transform the way in which the Voltec fighter handles but once you get into the swing of it you can slide the car in a nice controlled manner. 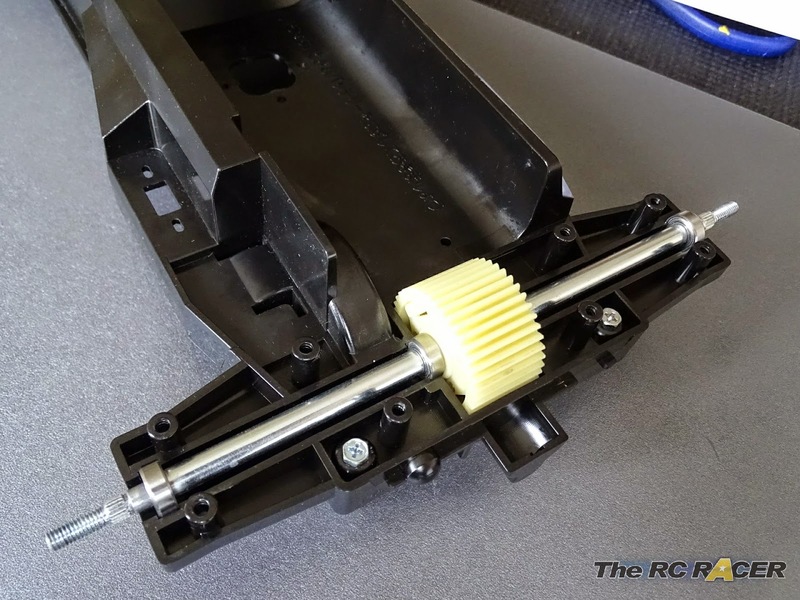 The drive train has no issues with the brushless motor and its actually pretty quiet and smooth. Needless to say though if you hit anything too large the car will spring in the air so be careful to ensure the surface is smooth. 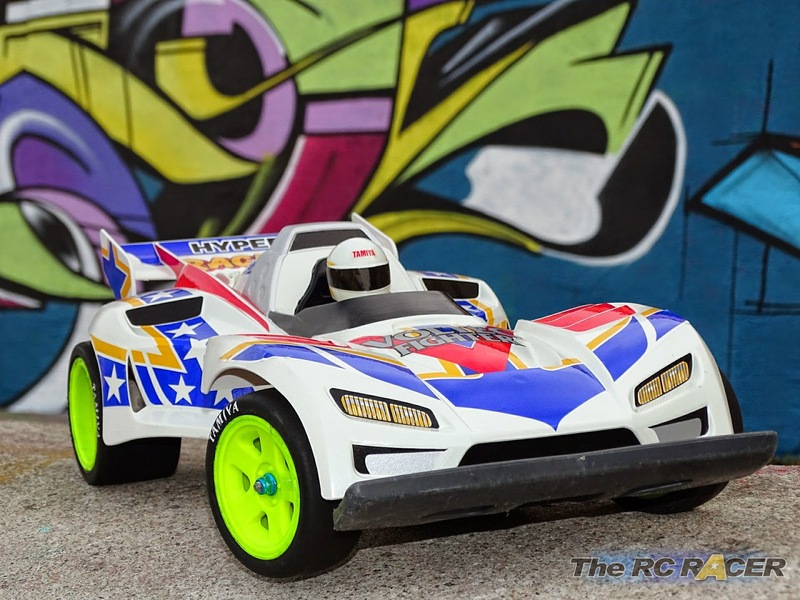 The RC boys cars are a range of cars that divided opinion upon their initial launch, and still have people enchanted and bemused in equal measure. I have a soft spot for the car as I did race it for a few weeks at a local club against a friend with a TT01 and we had a lot of fun pushing each other further to see how fast we could get our individual cars to go. The bumper has seen a lot of action! I also had my young son build one when he was 7, he managed to build it unaided (Other than electric installation) and that shows that it works for the intended purpose. I wouldn't recommend one nowadays for a beginner, as these are now more of a curio for collectors or someone that wants something a little different. 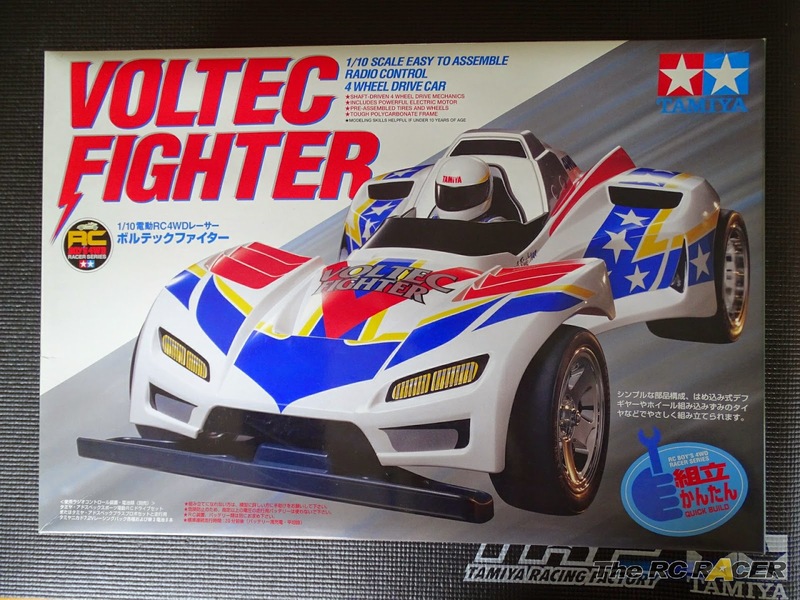 In conclusion the Voltec Fighter and both its compatriots the Wild Ceptor and Thunder Blitz are a rare, quirky Tamiya release that is unique in the world of RC. When you add the fantastic styling and surprisingly fun drive that they offer, then you might understand why I think they are so special.